These highlights do not include all the information needed to use ADLYXIN safely and effectively. See full prescribing information for ADLYXIN. ADLYXIN is a glucagon-like peptide-1 (GLP-1) receptor agonist indicated as an adjunct to diet and exercise to improve glycemic control in adults with type 2 diabetes mellitus (1). Initiate at 10 mcg once daily for 14 days. On Day 15, increase dosage to 20 mcg once daily (2.1). Administer once daily within one hour before the first meal of the day (2.2). 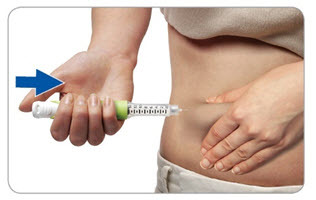 Inject subcutaneously in the abdomen, thigh or upper arm (2.2). Injection: 50 mcg/mL in 3 mL in green prefilled pen (for 14 pre-set doses; 10 mcg per dose) (3). Injection: 100 mcg/mL in 3 mL in burgundy prefilled pen (for 14 pre-set doses; 20 mcg per dose) (3). Hypersensitivity to ADLYXIN or any product components. Hypersensitivity reactions including anaphylaxis have occurred with ADLYXIN (4). Anaphylaxis and Serious Hypersensitivity Reactions: Discontinue ADLYXIN and promptly seek medical advice (5.1). Pancreatitis: Discontinue promptly if pancreatitis is suspected. Do not restart if pancreatitis is confirmed. Consider other antidiabetic therapies in patients with a history of pancreatitis (5.2). Never share ADLYXIN pen between patients, even if the needle is changed (5.3). Hypoglycemia with Concomitant use of Sulfonylurea or Basal Insulin: When ADLYXIN is used with a sulfonylurea or basal insulin, consider lowering the dose of the sulfonylurea or basal insulin to reduce the risk of hypoglycemia. (5.4). Acute Kidney Injury: Monitor renal function in patients with renal impairment reporting severe adverse gastrointestinal reactions. ADLYXIN is not recommended in patients with end stage renal disease (5.5). Immunogenicity: Patients may develop antibodies to lixisenatide. If there is worsening glycemic control or failure to achieve targeted glycemic control, significant injection site reactions or allergic reactions, alternative antidiabetic therapy should be considered (5.6). Macrovascular Outcomes: Clinical studies have not shown macrovascular risk reduction with ADLYXIN or any other antidiabetic drug (5.7). The most common adverse reactions (≥5%) of patients treated with ADLYXIN are nausea, vomiting, headache, diarrhea, dizziness, and hypoglycemia (6.1). ADLYXIN delays gastric emptying which may impact absorption of concomitantly administered oral medications. Oral medications that are particularly dependent on threshold concentrations for efficacy, such as antibiotics, or medications for which a delay in effect is undesirable, such as acetaminophen, should be administered 1 hour before ADLYXIN (7.1, 12.3). Oral contraceptives should be taken at least 1 hour before ADLYXIN administration or 11 hours after the dose of ADLYXIN (7.1, 12.3). Pregnancy: ADLYXIN should be used during pregnancy only if the potential benefit justifies the potential risk to the fetus (8.1). ADLYXIN is indicated as an adjunct to diet and exercise to improve glycemic control in adults with type 2 diabetes mellitus. ADLYXIN has not been studied in patients with chronic pancreatitis or a history of unexplained pancreatitis. Consider other antidiabetic therapies in patients with a history of pancreatitis [see Warnings and Precautions (5.2)]. ADLYXIN is not a substitute for insulin. ADLYXIN is not indicated for use in patients with type 1 diabetes mellitus or for treatment of diabetic ketoacidosis. The concurrent use of ADLYXIN with short acting insulin has not been studied and is not recommended. ADLYXIN has not been studied in patients with gastroparesis and is not recommended in patients with gastroparesis. The starting dose of ADLYXIN is 10 mcg subcutaneously once daily for 14 days. Increase the dose to the maintenance dose of 20 mcg once daily starting on Day 15. Instruct patients and caregivers on the preparation and use of the pen prior to first use of ADLYXIN. Training should include a practice injection. Inspect ADLYXIN visually before use. It should appear clear and colorless. Do not use ADLYXIN if particulate matter or coloration is seen. 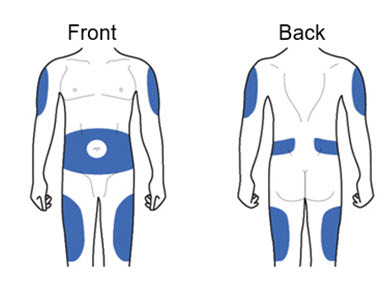 Administer ADLYXIN by subcutaneous injection in the abdomen, thigh or upper arm once daily. Rotate injections sites with each dose. Do not use the same site for each injection. Instruct patients to administer an injection of ADLYXIN within one hour before the first meal of the day preferably the same meal each day. If a dose is missed, administer ADLYXIN within one hour prior to the next meal. Instruct patients to protect the pen from light by keeping it in its original packaging and to discard pen 14 days after its first use. ADLYXIN is contraindicated in patients with known hypersensitivity to lixisenatide or to any component of ADLYXIN. Hypersensitivity reactions including anaphylaxis have occurred with ADLYXIN [see Warnings and Precautions (5.1) and Adverse reactions (6.1)]. In clinical trials of ADLYXIN, there have been cases of anaphylaxis determined to be related to ADLYXIN (frequency of 0.1% or 10 cases per 10,000 patient-years). Other serious hypersensitivity reactions including angioedema also occurred [see Adverse Reactions (6.1)]. Inform and closely monitor patients with a history of anaphylaxis or angioedema with another GLP-1 receptor agonist for allergic reactions, because it is unknown whether such patients will be predisposed to anaphylaxis with ADLYXIN. ADLYXIN is contraindicated in patients with known hypersensitivity to lixisenatide [see Contraindications (4)]. If a hypersensitivity reaction occurs, the patient should discontinue ADLYXIN and promptly seek medical attention. Acute pancreatitis, including fatal and non-fatal hemorrhagic or necrotizing pancreatitis, has been reported postmarketing in patients treated with GLP-1 receptor agonists. In clinical trials of ADLYXIN, there were 21 cases of pancreatitis among ADLYXIN-treated patients and 14 cases in comparator-treated patients (incidence rate of 21 vs. 17 per 10,000 patient-years). ADLYXIN cases were reported as acute pancreatitis (n=3), pancreatitis (n=12), chronic pancreatitis (n=5), and edematous pancreatitis (n=1). Some patients had risk factors for pancreatitis, such as a history of cholelithiasis or alcohol abuse. After initiation of ADLYXIN, observe patients carefully for signs and symptoms of pancreatitis (including persistent severe abdominal pain, sometimes radiating to the back and which may or may not be accompanied by vomiting). If pancreatitis is suspected, promptly discontinue ADLYXIN and initiate appropriate management. If pancreatitis is confirmed, do not restart ADLYXIN. Consider antidiabetic therapies other than ADLYXIN in patients with a history of pancreatitis. ADLYXIN pens should never be shared between patients, even if the needle is changed. Pen-sharing poses a risk for transmission of blood-borne pathogens. Patients receiving ADLYXIN in combination with basal insulin or a sulfonylurea have an increased risk of hypoglycemia. In patients receiving sulfonylurea with or without metformin, 14.5% patients on ADLYXIN reported symptomatic hypoglycemia compared to 10.6% for those on placebo. In patients receiving basal insulin with or without metformin, 28.3% patients on ADLYXIN reported symptomatic hypoglycemia compared to 23.0% for those on placebo. In patients receiving basal insulin with sulfonylurea, 47.2% patients on ADLYXIN reported symptomatic hypoglycemia compared to 21.6% for those on placebo. Reduction in the dose of sulfonylurea or basal insulin may be necessary [see Adverse Reactions (6.1) and Drug Interactions (7.2)]. Acute kidney injury and worsening of chronic renal failure, which may sometimes require hemodialysis has been reported postmarketing in patients treated with GLP-1 receptor agonists. Some of these events were reported in patients without known underlying renal disease. A majority of the reported events occurred in patients who had experienced nausea, vomiting, diarrhea, or dehydration. Monitor renal function when initiating or escalating doses of ADLYXIN in patients with renal impairment and in patients reporting severe gastrointestinal reactions. ADLYXIN is not recommended in patients with end stage renal disease [see Use in Specific Populations (8.6)]. Patients may develop antibodies to lixisenatide following treatment with ADLYXIN. A pooled analysis of studies of lixisenatide-treated patients showed that 70% were antibody positive at Week 24. In the subset of patients (2.4 %) with the highest antibody concentrations (>100 nmol/L), an attenuated glycemic response was observed. A higher incidence of allergic reactions and injection site reactions occurred in antibody positive patients [see Warnings and Precautions (5.1), Adverse Reactions (6.2)]. If there is worsening glycemic control or failure to achieve targeted glycemic control, significant injection site reactions or allergic reactions, alternative antidiabetic therapy should be considered [see Adverse Reactions (6.1)]. Clinical studies have not shown macrovascular risk reduction with ADLYXIN or any other antidiabetic drug [see Clinical Studies (14)]. The data in Table 1 are derived from the placebo-controlled trials [see Clinical Studies (14)]. These data reflect exposure of 2869 patients to ADLYXIN and a mean duration of exposure to ADLYXIN of 21.7 weeks. Across the treatment arms, the mean age of patients was 56.1 years, 2.3% were 75 years or older and 48.2% were male. The population in these studies was 63.7% White, 2.6% Black or African American, 32.0% Asian; 18.9% were of Hispanic or Latino ethnicity. At baseline, the population had diabetes for an average of 8.2 years and had a mean HbA1c of 8.1%. At baseline, 11.2% of the population reported retinopathy. Baseline estimated renal function was normal or mildly impaired (eGFR ≥60 mL/min/1.73 m2) in 95.3% of the pooled study populations. Table 1 shows common adverse reactions, excluding hypoglycemia, associated with the use of ADLYXIN in the pool of placebo-controlled trials. These adverse reactions were not present at baseline, occurred more commonly on ADLYXIN than on placebo, and occurred in at least 5% of patients treated with ADLYXIN. In the pool of placebo-controlled trials, gastrointestinal adverse reactions occurred more frequently among patients receiving ADLYXIN than placebo (placebo 18.4%, ADLYXIN 39.7%). More patients receiving ADLYXIN (4.3%) discontinued treatment due to gastrointestinal adverse reactions than patients receiving placebo (0.5%). Investigators graded the severity of gastrointestinal adverse reactions occurring on ADLYXIN as "mild" in 64.2% of cases, "moderate" in 32.3% of cases, or "severe" in 3.5% of cases. The majority of these adverse reactions occurred during the first 3 weeks after starting treatment. In addition to the reactions in Table 1, the following adverse reactions were reported in >2% of patients and more frequently in ADLYXIN-treated patients than placebo (frequencies listed, respectively, as: placebo; ADLYXIN): dyspepsia (0.2%, 3.2%), constipation (1.8%, 2.8%), abdominal distension (0.9%, 2.2%), abdominal pain upper (0.9%, 2.2%), abdominal pain (1.5%, 2.0%). Symptomatic hypoglycemia was defined as an event with clinical symptoms that were considered to result from a hypoglycemic episode with an accompanying plasma glucose <60 mg/dL or associated with prompt recovery after oral carbohydrate, intravenous glucose, or glucagon administration if no plasma glucose value was available. Severe symptomatic hypoglycemia was defined as an event with clinical symptoms that were considered to result from hypoglycemia in which the patient required the assistance of another person, associated with a plasma glucose level below 36 mg/dL or, associated with prompt recovery after oral carbohydrate, intravenous glucose, or glucagon administration if no plasma glucose was available. Table 2 summarizes the incidence of symptomatic hypoglycemia and severe hypoglycemia in seven placebo-controlled efficacy/safety studies. Injections site reactions (e.g., pain, pruritus and erythema) were reported more frequently in ADLYXIN-treated patients (4%) than placebo treated patients (2 %). In the ADLYXIN development program anaphylaxis cases were adjudicated. Anaphylaxis was defined as a skin or mucosal lesion of acute onset associated with at least 1 other organ system involvement. Symptoms such as hypotension, laryngeal edema or severe bronchospasm could be present but were not required for the case definition. More cases adjudicated as meeting the definition for anaphylaxis occurred in ADLYXIN-treated patients (incidence rate of 0.2% or 16 cases per 10,000 patient years) than placebo treated patient (incidence rate of 0.1% or 7 cases per 10,000 patient years). Allergic reactions (such as anaphylactic reaction, angioedema and urticaria) adjudicated as possibly related to the study medication were observed more frequently in ADLYXIN-treated patients (0.4%) than placebo-treated patient (0.2%) [see Warnings and Precautions (5.1)]. In the pool of 9 placebo-controlled studies, 70% of patients exposed to lixisenatide tested positive for anti-lixisenatide antibodies during the trials. In the subset of patients (2.4%) with the highest antibody concentrations (>100 nmol/L), an attenuated glycemic response was observed. A higher incidence of allergic reactions and injection site reactions occurred in antibody positive patients [see Warnings and Precautions (5.6)]. Anti-lixisenatide antibody characterization studies have demonstrated the potential for development of antibodies cross-reactive with endogenous GLP-1 and glucagon, but their incidence has not been fully determined and the clinical significance of these antibodies is not currently known. No information regarding the presence of neutralizing antibodies is currently available. The detection of antibody formation is highly dependent on the sensitivity and specificity of the assay. Additionally, the observed incidence of antibody (including neutralizing antibody) positivity in an assay may be influenced by several factors including assay methodology, sample handling, timing of sample collection, concomitant medications, and underlying disease. For these reasons, the incidence of antibodies to lixisenatide cannot be directly compared with the incidence of antibodies with other products. ADLYXIN delays gastric emptying which may reduce the rate of absorption of orally administered medications. Use caution when coadministering oral medications that have a narrow therapeutic ratio or that require careful clinical monitoring. These medications should be adequately monitored when concomitantly administered with ADLYXIN. If such medications are to be administered with food, patients should be advised to take them with a meal or snack when ADLYXIN is not administered. Oral medications that are particularly dependent on threshold concentrations for efficacy, such as antibiotics, or medications for which a delay in effect is undesirable, such as acetaminophen, should be administered at least 1 hour before ADLYXIN injection [see Clinical Pharmacology (12.3)]. Patients taking oral contraceptives should be advised to take them at least 1 hour before ADLYXIN administration or at least 11 hours after the dose of ADLYXIN [see Clinical Pharmacology (12.3)]. When ADLYXIN is added to a sulfonylurea or basal insulin, there is a potential risk of hypoglycemia. A reduction of the concomitantly administered sulfonylurea or basal insulin may be necessary [see Warnings and Precautions (5.4) and Adverse Reactions (6.1)]. The limited available data with lixisenatide in pregnant women are not sufficient to inform a drug-associated risk of major birth defects and miscarriage. There are risks to the mother and fetus associated with poorly controlled diabetes in pregnancy [see Clinical Considerations]. Based on animal reproduction studies, there may be risks to the fetus from exposure to lixisenatide during pregnancy. ADLYXIN should be used during pregnancy only if the potential benefit justifies the potential risk to the fetus. Lixisenatide administered to pregnant rats and rabbits during organogenesis was associated with visceral closure and skeletal defects at systemic exposures that decreased maternal food intake and weight gain during gestation, and that are 1-time and 6-times higher than the 20 mcg/day clinical dose, respectively, based on plasma AUC [see Data]. The estimated background risk of major birth defects is 6–10% in women with pre-gestational diabetes with a HbA1c >7 and has been reported to be as high as 20–25% in women with a HbA1c >10. The estimated background risk of miscarriage for the indicated population is unknown. In the U.S. general population, the estimated background risk of major birth defects and miscarriage in clinically recognized pregnancies is 2–4% and 15–20%, respectively. Poorly controlled diabetes in pregnancy increases the maternal risk for diabetic ketoacidosis, pre-eclampsia, spontaneous abortions, preterm delivery, stillbirth and delivery complications. Poorly controlled diabetes increases the fetal risk for major birth defects, stillbirth, and macrosomia related morbidity. In pregnant rats receiving twice daily subcutaneous doses of 2.5, 35, or 500 mcg/kg during organogenesis (gestation day 6 to 17), fetuses were present with visceral closure defects (e.g., microphthalmia, bilateral anophthalmia, diaphragmatic hernia) and stunted growth. Impaired ossification associated with skeletal malformations (e.g., bent limbs, scapula, clavicle, and pelvis) were observed at ≥5 mcg/kg/day, resulting in systemic exposure that is 1-time the 20 mcg/day clinical dose, based on plasma AUC. Decreases in maternal body weight, food consumption, and motor activity were observed concurrent with the adverse fetal findings, which confounds the interpretation of relevance of these malformations to the human risk assessment. Placental transfer of lixisenatide to developing rat fetuses is low with a concentration ratio in fetal/maternal plasma of 0.1%. In pregnant rabbits receiving twice daily subcutaneous doses of 2.5, 25, 250 mcg/kg during organogenesis (gestation day 6 to 18), fetuses were present with multiple visceral and skeletal malformations, including closure defects, at ≥5 mcg/kg/day or systemic exposures that are 6-times the 20 mcg/day clinical dose, based on plasma AUC. Decreases in maternal body weight, food consumption, and motor activity were observed concurrent with the fetal findings, which confounds the interpretation of relevance of these malformations to the human risk assessment. Placental transfer of lixisenatide to developing rabbit fetuses is low with a concentration ratio in fetal/maternal plasma of ≤0.3%. In a second study in pregnant rabbits, no drug-related malformations were observed from twice daily subcutaneous doses of 0.15, 1.0, and 2.5 mcg/kg administered during organogenesis, resulting in systemic exposures up to 9-times the clinical exposure at 20 mcg/day, based on plasma AUC. In pregnant rats given twice daily subcutaneous doses of 2, 20, or 200 mcg/kg from gestation day 6 through lactation, decreases in maternal body weight, food consumption, motor activity were observed at all doses. Skeletal malformations and increased pup mortality were observed at 400 mcg/kg/day, which is approximately 200-times the 20 mcg/day clinical dose, based on mcg/m2. There is no information regarding the presence of ADLYXIN in human milk, the effects on the breastfed infant, or the effects on milk production. However, lixisenatide is present in rat milk [see Data]. The developmental and health benefits of breastfeeding should be considered along with the mother's clinical need for lixisenatide and any potential adverse effects on the breastfed infant from lixisenatide or from the underlying maternal condition. A study in lactating rats showed low (9.4%) transfer of lixisenatide and its metabolites into milk and negligible (0.01%) levels of unchanged lixisenatide peptide in the gastric contents of weaning offspring. Safety and effectiveness of ADLYXIN have not been established in pediatric patients below 18 years of age. In Phase 2 and 3 controlled clinical studies of ADLYXIN, a total of 1837 (25%) of the patients exposed to the study medication were 65 years of age and over and 288 (4%) were 75 years of age and over. No overall differences were observed in safety or effectiveness between these patients and younger patients, but individual sensitivity cannot be ruled out. In patients with mild renal impairment (eGFR: 60–89 mL/min/1.73 m2) no dose adjustment is required [see Clinical Pharmacology (12.3)] but close monitoring for ADLYXIN related adverse reactions [see Adverse Reactions (6.1)] and for changes in renal function is recommended because a higher incidence of hypoglycemia, nausea and vomiting were observed in these patients. 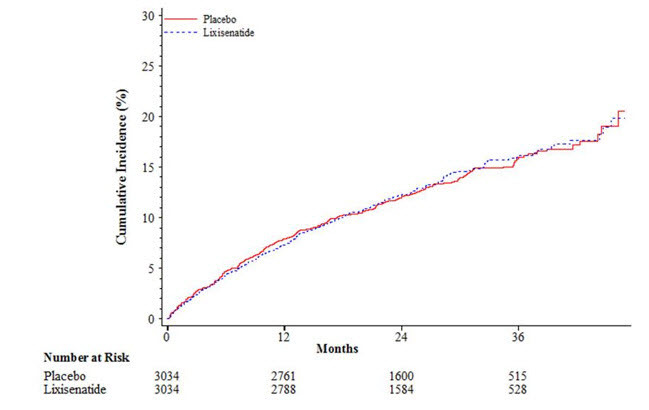 In a cardiovascular outcome study, 655 (22%) lixisenatide treated patients had moderate renal impairment (eGFR: 30 to less than 60 mL/min/1.73 m2). No dosing adjustment is recommended in patients with moderate renal impairment [see Clinical Pharmacology (12.3)] but close monitoring for ADLYXIN related adverse gastrointestinal reactions [see Adverse Reactions (6.1)] and for changes in renal function is recommended because these may lead to dehydration and acute renal failure and worsening of chronic failure in these patients [see Warnings and Precautions (5.5)]. Clinical experience in patients with severe renal impairment is limited as there were only 5 patients with severe renal impairment (eGFR 15 to less than 30 mL/min/1.73 m2) exposed to ADLYXIN in all controlled studies. Lixisenatide exposure was higher in these patients [see Clinical Pharmacology (12.3)]. Patients with severe renal impairment exposed to ADLYXIN should be closely monitored for occurrence of gastrointestinal adverse reactions and for changes in renal function [see Warnings and Precautions (5.5)]. There is no therapeutic experience in patients with end stage renal disease (eGFR <15 mL/min/1.73 m2), and it is not recommended to use ADLYXIN in this population [see Clinical Pharmacology (12.3)]. During clinical studies, doses up to 30 mcg of lixisenatide twice daily (3 times the daily recommended dose) were administered to type 2 diabetic patients in a 13-week study. The 30 mcg dose of lixisenatide is not an approved dose. An increased incidence of gastrointestinal disorders was observed. In case of overdose, appropriate supportive treatment should be initiated according to the patient's clinical signs and symptoms. 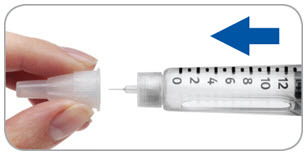 ADLYXIN injection is a sterile, clear, colorless aqueous solution for subcutaneous administration. ADLYXIN is supplied in two single-patient use prefilled pens. Each green prefilled pen contains 3 mL solution and each mL contains 50 mcg lixisenatide. Each burgundy prefilled pen contains 3 mL solution, and each mL contains 100 mcg lixisenatide. Inactive ingredients for both prefilled pens are glycerol 85% (54 mg), sodium acetate trihydrate (10.5 mg), methionine (9.0 mg), metacresol (8.1 mg), and water for injection. Hydrochloric acid and/or sodium hydroxide may be added to adjust pH. Lixisenatide is a GLP-1 receptor agonist. Lixisenatide increases glucose-dependent insulin release, decreases glucagon secretion, and slows gastric emptying. In a clinical pharmacology study in adults with type 2 diabetes mellitus, ADLYXIN reduced fasting plasma glucose and postprandial blood glucose AUC0–300min compared to placebo (-33.8 mg/dL and -387 mg*h/dL, respectively) following a standardized test meal. The effect on postprandial blood glucose AUC was most notable with the first meal, and the effect was attenuated with later meals in the day. Treatment with ADLYXIN 20 mcg once daily reduced postprandial glucagon levels (AUC0–300min) compared to placebo by -15.6 h*pmol/L after a standardized test meal in patients with type 2 diabetes. At a dose 1.5 times the recommended dose, ADLYXIN does not prolong the QTc interval to any clinically relevant extent. No increase in mean heart rate was seen in phase 3 placebo-controlled studies. Following subcutaneous administration in patients with type 2 diabetes, the median tmax is 1 to 3.5 hours. There are no clinically relevant differences in the rate of absorption when lixisenatide is administered subcutaneously in the abdomen, thigh, or arm. The apparent volume of distribution after subcutaneous administration of lixisenatide (Vz/F) is approximately 100 L.
Lixisenatide is presumed to be eliminated through glomerular filtration, and proteolytic degradation. After multiple dose administration in patients with type 2 diabetes, mean terminal half-life was approximately 3 hours and the mean apparent clearance (CL/F) about 35 L/h. Age, body weight, gender, and race were not observed to meaningfully affect the pharmacokinetics of lixisenatide in population PK analyses [see Use in Specific Populations (8.5)]. Compared to healthy subjects [Creatinine Clearance using Cockcroft-Gault [CLcr] greater than or equal to 90 mL/min (N=4)], plasma Cmax of lixisenatide was increased by approximately 60%, 42%, and 83% in subjects with mild [CLcr 60–89 mL/min (N=9)], moderate [CLcr 30–59 mL/min (N=11)], and severe [CLcr 15–29 mL/min (N=8)] renal impairment. Plasma AUC was increased by approximately 34%, 69% and 124% with mild, moderate and severe renal impairment, respectively [see Use in Specific Populations (8.6)]. No pharmacokinetic study has been performed in patients with acute or chronic hepatic impairment. Hepatic dysfunction is not expected to affect the pharmacokinetics of lixisenatide. ADLYXIN 10 mcg did not change the overall exposure (AUC) of acetaminophen following administration of a single dose of acetaminophen 1000 mg, whether before or after ADLYXIN. No effects on acetaminophen Cmax and tmax were observed when acetaminophen was administered 1 hour before ADLYXIN. When administered 1 or 4 hours after 10 mcg of ADLYXIN, Cmax of acetaminophen was decreased by 29% and 31% respectively and median tmax was delayed by 2.0 and 1.75 hours, respectively. Administration of a single dose of an oral contraceptive medicinal product (ethinylestradiol 0.03 mg/levonorgestrel 0.15 mg) 1 hour before or 11 hours after 10 mcg of ADLYXIN, did not change Cmax, AUC, t1/2 and tmax of ethinylestradiol and levonorgestrel. Administration of a single dose of an oral contraceptive medicinal product (ethinylestradiol 0.03 mg/levonorgestrel 0.15 mg) 1 hour or 4 hours after 10 mcg of ADLYXIN did not affect the overall exposure (AUC) and mean terminal half-life (t1/2) of ethinylestradiol and levonorgestrel. However, Cmax of ethinylestradiol was decreased by 52% and 39% respectively and Cmax of levonorgestrel was decreased by 46% and 20%, respectively and median tmax was delayed by 1 to 3 hours [see Drug Interactions (7.1)]. When ADLYXIN 20 mcg and atorvastatin 40 mg were coadministered in the morning for 6 days, the overall exposure (AUC) of atorvastatin was not affected, while Cmax was decreased by 31% and tmax was delayed by 3.25 hours. No such increase for tmax was observed when atorvastatin was administered in the evening and ADLYXIN in the morning but the AUC and Cmax of atorvastatin were increased by 27% and 66% respectively. After concomitant administration of warfarin 25 mg with repeated dosing of ADLYXIN 20 mcg, there were no effects on AUC or INR (International Normalized Ratio) while Cmax was reduced by 19% and tmax was delayed by 7 hours [see Drug Interactions (7.1)]. After concomitant administration of ADLYXIN 20 mcg and digoxin 0.25 mg at steady state, the AUC of digoxin was not affected. The tmax of digoxin was delayed by 1.5 hour and the Cmax was reduced by 26% [see Drug Interactions (7.1)]. After concomitant administration of ADLYXIN 20 mcg and ramipril 5 mg during 6 days, the AUC of ramipril was increased by 21% while the Cmax was decreased by 63%. The AUC and Cmax of the active metabolite (ramiprilat) were not affected. The tmax of ramipril and ramiprilat were delayed by approximately 2.5 hours. Carcinogenicity studies of 2-years durations were conducted in CD-1 mice and Sprague-Dawley rats with twice daily subcutaneous doses of 40, 200, or 1,000 mcg/kg. A statistically significant increase in thyroid C-cell adenomas was observed in male mice at 2,000 mcg/kg/day, resulting in systemic exposures that are >180-times the human exposure achieved at 20 mcg/day based on plasma AUC. Statistically significant increases in thyroid C-cell adenomas were seen at all doses in rats, resulting in systemic exposures that are ≥15-times the human exposure achieved at 20 mcg/day based on plasma AUC. A numerical increase in thyroid C-cell carcinomas was observed in rats at ≥ 400 mcg/kg/day, resulting in systemic exposures that are >56-times the human exposure achieved at 20 mcg/day based on plasma AUC. Lixisenatide was not mutagenic or clastogenic in a standard battery of genotoxicity tests (bacterial mutagenicity (Ames), human lymphocyte chromosome aberration, mouse bone marrow micronucleus). Studies in which male and female rats received twice daily subcutaneous doses of 2, 29, or 414 mcg/kg/dose prior to pairing through gestation day 6 did not indicate any adverse effects on male or female fertility in rats up to the highest dose tested, 414 mcg/kg/dose, which is approximately 400-times the clinical dose at 20 mcg/day based on mcg/m2. ADLYXIN has been studied as monotherapy, in combination with oral antidiabetic medications, and in combination with basal insulin (with or without oral antidiabetic medications). The efficacy of ADLYXIN was compared with placebo, exenatide, and insulin glulisine. In patients with type 2 diabetes, ADLYXIN produced reductions from baseline in HbA1c compared to placebo. In a 12-week double blind study, 241 patients with type 2 diabetes inadequately controlled on diet and exercise were randomized to ADLYXIN 20 mcg once daily or placebo. The mean age of the study population was 53.9 years, and the mean duration of type 2 diabetes mellitus was 2.5 years. 51.0% were male. 72.6% were White, 2.5% were Black or African American. 22.0% were Hispanic. 3.7% had an eGFR <60 ml/min/1.73 m2 . The mean BMI was 32 kg/m2. Compared with placebo, treatment with ADLYXIN 20 mcg once daily resulted in statistically significant reductions in HbA1c from baseline at Week 12 (see Table 3). The adjusted mean change in weight from baseline did not differ significantly between ADLYXIN (-1.9 kg) and placebo (-2.0 kg). ITT population = all randomized patients. 10% of patients in ADLYXIN and 10% in the placebo had missing HbA1c data at Week 12 in the ITT population. Using multiple imputation with respect to jump to placebo for missing data at Week 12 in the ADLYXIN group. Patients with missing HbA1c value at Week 12 were considered non-responders. In a 24-week study, 323 patients with type 2 diabetes inadequately controlled on diet exercise and metformin were randomized to ADLYXIN 20 mcg once daily or placebo. The mean age of the study population was 56.7 years, and the mean duration of type 2 diabetes mellitus was 5.9 years. 44.6% were male. 90.1% were White, 0.6% were Black or African American. 27.9% were Hispanic. 1.2% had an eGFR <60 mL/min/1.73 m2. The mean BMI was 33 kg/m2. The mean dose of metformin was 1955 mg per day. Compared with placebo, treatment with ADLYXIN 20 mcg once daily resulted in statistically significant reductions in HbA1c from baseline at Week 24 (see Table 4). 11% of patients in ADLYXIN 20 mcg and 6% in the placebo had missing HbA1c data at Week 24 in the ITT population. Using multiple imputation with respect to jump to placebo for missing data at Week 24 in the ADLYXIN group. Patients with missing HbA1c value at Week 24 were considered non-responders. In a 24-week study, 391 Asian patients with type 2 diabetes inadequately controlled on diet exercise and metformin with or without a sulfonylurea were randomized to ADLYXIN 20 mcg once daily or placebo. The mean age of the study population was 54.8 years, and mean duration of type 2 diabetes mellitus was 6.6 years. 49.1% were male. All patients were Asian. 2.8% had an eGFR <60 mL/min/1.73 m2. The mean BMI was 27 kg/m2. The mean dose of metformin was 1368 mg per day and 44.8% of patients were on a sulfonylurea. Compared with placebo, treatment with ADLYXIN 20 mcg once daily resulted in statistically significant reductions in HbA1c from baseline at Week 24 (see Table 5). 7% of patients in ADLYXIN and 6% in the placebo had missing HbA1c data at Week 24 in the ITT population. In a 24-week open-label study, 634 patients with type 2 diabetes inadequately controlled on diet, exercise and metformin were randomized to ADLYXIN 20 mcg once daily or exenatide 10 mcg twice daily. The mean age of the study population was 57.4 years, and mean duration of type 2 diabetes mellitus was 6.8 years. 53.3% were male. 92.7% were White, 2.8% were Black or African American. 26.8% were Hispanic. 1.7% had an eGFR <60 mL/min/1.73 m2. The mean BMI was 34 kg/m2. The mean dose of metformin was 2039 mg per day. ADLYXIN 20 mcg once daily met the pre-specified non-inferiority margin of 0.4% versus exenatide 10 mg BID for the difference in HbA1c reduction from baseline (see Table 6). However in this study, ADLYXIN provided less HbA1c reduction than exenatide 10 mg BID and the difference was statistically significant (p=0.0175). Using multiple imputation with respect to use the baseline value for missing data at Week 24 in each group. In a 24-week study, 859 patients with type 2 diabetes inadequately controlled with diet, exercise and a sulfonylurea with or without metformin were randomized to ADLYXIN 20 mcg once daily or placebo. The mean age of the study population was 57.2 years, and mean duration of type 2 diabetes mellitus was 9.3 years. 50.5% were male. 52.2% were White, 3.0% were Black or African American. 2.7% were Hispanic. 4.7% had an eGFR <60 mL/min/1.73 m2. The mean BMI was 30 kg/m2. The two most common sulfonylureas used were glimepiride and glibenclamide and the mean dose of these drugs at baseline were 5.1 mg and 12.9 mg respectively, and 84.4% of patients were on metformin. Compared with placebo, treatment with ADLYXIN 20 mcg once daily resulted in statistically significant reductions in HbA1c from baseline at Week 24 (see Table 7). 13% of patients in ADLYXIN and 13% in the placebo had missing HbA1c data at Week 24 in the ITT population. In a 24-week study, 484 patients with type 2 diabetes with inadequately controlled with diet, exercise and pioglitazone with or without metformin were randomized to ADLYXIN 20 mcg once daily or placebo. The mean age of the study population was 55.8 years, and mean duration of type 2 diabetes mellitus was 8.1 years. 52.5% were male. 83.7% were White, 4.8% were Black or African American. 26.4% were Hispanic. 4.1% had an eGFR <60 mL/min/1.73 m2. The mean BMI was 34 kg/m2. The mean dose of pioglitazone was 33.6 mg per day and 81.0% of patients were on metformin. Compared with placebo, treatment with ADLYXIN 20 mcg once daily resulted in statistically significant reductions in HbA1c from baseline at Week 24 (see Table 8). 9% of patients in ADLYXIN and 12% in the placebo had missing HbA1c data at Week 24 in the ITT population. In a 24-week study, 496 patients with type 2 diabetes inadequately controlled on diet, exercise and basal insulin with or without metformin were randomized to ADLYXIN 20 mcg once daily or placebo. The mean age of the study population was 57.2 years, and mean duration of type 2 diabetes mellitus was 12.46 years. 46.0% were male. 77.6% were White, 4.0% were Black or African American. 27.0% were Hispanic. 3.2% had an eGFR <60 mL/min/1.73 m2. The mean BMI was 32 kg/m2. At baseline, the mean basal insulin dose was 54.9 units and 79.2% of individuals were receiving metformin. In another 24-week study, 311 Asian patients with type 2 diabetes inadequately controlled on diet, exercise and basal insulin with or without a sulfonylurea were randomized to ADLYXIN 20 mcg once daily or to placebo. The mean age of the study population was 58.4 years, and mean duration of type 2 diabetes mellitus was 13.92 years. 47.9% were male. All patients were Asian. 15.8% had an eGFR <60 mL/min/1.73 m2. The mean BMI was 25 kg/m2. At baseline, the mean basal insulin dose was 24.2 units and 70.4% of individuals were receiving a sulfonylurea. Compared with placebo, treatment with ADLYXIN 20 mcg once daily resulted in statistically significant reductions in HbA1c from baseline at Week 24 (see Table 9) in both studies. 16% of patients in ADLYXIN and 13% in the placebo had missing HbA1c data at Week 24 with basal insulin +/- metformin in the ITT population. Conducted in an Asian population. 8 % of patients in ADLYXIN and 6% of patients in placebo had missing HbA1c data at Week 24 with basal insulin +/- sulfonylurea in the ITT population. In a 24-week study, 446 patients with type 2 diabetes, inadequately controlled on diet exercise and on insulin glargine and metformin with or without thiazolidinediones, were randomized to ADLYXIN 20 mcg once daily or placebo. The mean age of the study population was 56.2 years, and mean duration of type 2 diabetes mellitus was 9.1 years. 49.8% were male. 74.4% were White, 4.5% were Black or African American. 22.6% were Hispanic. 3.8% had an eGFR <60 mL/min/1.73 m2. The mean BMI was 32 kg/m2. At baseline, the mean insulin glargine dose was 44.5 units, the mean metformin dose was 2049 mg and 12.1% of individuals were receiving thiazolidinedione. Compared with placebo, treatment with ADLYXIN 20 mcg once daily resulted in statistically significant reductions in HbA1c from baseline at Week 24 (see Table 10). 9% of patients in ADLYXIN and 5% in the placebo had missing HbA1c data at Week 24 in the ITT population. In a 26-week open-label study, 894 patients with type 2 diabetes inadequately controlled on diet, exercise and basal insulin combined with 1 to 3 oral antidiabetic agents were randomized to ADLYXIN 20 mcg once daily or insulin glulisine once daily (QD) or insulin glulisine three times a day (TID) combined with insulin glargine with or without metformin. The mean age of the study population was 59.8 years, and mean duration of type 2 diabetes mellitus was 12.2 years. 45.3% were male. 92.6% were White, 4.0% were Black or African American. 21.1% were Hispanic. 5.6% had an eGFR <60 mL/min/1.73 m2. The mean BMI was 32 kg/m2. At baseline, the mean insulin glargine dose was 65.9 units and 87.4% of individuals were receiving metformin. ADLYXIN 20 mcg once daily met the pre-specified non-inferiority margin of 0.4% versus insulin glulisine QD and TID for the difference in HbA1c reduction from baseline. However in this study, ADLYXIN provided less HbA1c reduction than insulin glulisine TID and the difference was statistically significant (p=0.0002). ITT population = all randomized patients. Non-inferiority margin = 0.4%. 12% of patients in ADLYXIN, 8% in glulisine QD and 5.0% in glulisine TID had missing HbA1c data at Week 26 in the ITT population. Using multiple imputation with respect to use the baseline value for missing data at Week 26 in each group. Patients with missing HbA1c value at Week 26 were considered non-responders. The ELIXA study was a randomized, double-blind, placebo-controlled, multinational study that evaluated cardiovascular (CV) outcomes during treatment with ADLYXIN in patients with type 2 diabetes mellitus after a recent Acute Coronary Syndrome event. The primary composite endpoint was the time to the first occurrence of a major adverse cardiovascular event or MACE+, defined as any of the following positively adjudicated events:Cardiovascular death, non-fatal myocardial infarction, or non-fatal stroke, or hospitalization for unstable angina. The study was designed as a non-inferiority trial with a pre-specified risk margin of 1.3 for the hazard ratio comparing ADLYXIN to placebo. Overall, 6068 patients were randomized 1:1 to either placebo or ADLYXIN 20 mcg (following a starting dose of 10 mcg during the first 2 weeks) and were included in the primary analyses. The demographics and baseline characteristics were well-balanced between treatments. The median age at study entry was 60 years. Approximately 69% of the patients were males and 75% were Caucasian. The majority of patients were either obese or overweight with a median BMI of 29.4 kg/m2. The mean duration of diabetes was 9.3 years. More than 75% of patients had impaired renal function and more than 20% had an estimated GFR less than 60 mL/min/ 1.73 m2. Use of CV medications at baseline was similar between treatments; platelet aggregation inhibitors (aspirin and/or clopidogrel) were used by 97.5% of patients, statins by 92.7%, ACE inhibitors and/or angiotensin II antagonists by 86.8%, and beta-blockers by 84.4%. Prior to study entry, 93.9% of patients used at least 1 glucose-lowering medication, including metformin (69.9%), sulfonylureas (37.3%) and insulin (47.6%). During the study, antidiabetic medications were adjusted by the investigators per the local standard of care. Ninety-six percent of the patients in both treatment groups completed the study in accordance with the protocol, and the vital status was known at the end of the study for 99.0% and 98.6% of the patients in the ADLYXIN and placebo group, respectively. Median treatment duration was 22.4 months in the ADLYXIN group and 23.3 months in the placebo group, and the median duration of study follow-up was 25.8 and 25.7 months; respectively. The results of the primary composite cardiovascular endpoint are shown in Table 12. The hazard ratio (HR) for ADLYXIN versus placebo was 1.02, with an associated 2-sided 95% confidence interval (CI) of 0.89 to 1.17. The upper bound of this confidence interval, 1.17, excluded a risk margin larger than 1.3. CI: confidence interval, CV: cardiovascular. Only positively adjudicated events by the Cardiovascular Events Adjudication Committee are included. The Kaplan-Meier based cumulative event probability is presented in Figure1 for the time to first occurrence of the primary CV composite endpoint by treatment arm. ADLYXIN injection is supplied in a disposable single-patient use pen containing a sterile, clear solution for subcutaneous administration. Each prefilled pen contains 3 mL solution. The green starter pen contains 50 mcg/mL of ADLYXIN and delivers 14 doses of 10 mcg, and the burgundy maintenance pen contains 100 mcg/mL of ADLYXIN and delivers 14 doses of 20 mcg. Starter Pack, NDC 0024-5745-02: For treatment initiation, Starter Pack contains 1 prefilled green pen of ADLYXIN 10 mcg (NDC 0024-5741-01) and 1 prefilled burgundy pen of ADLYXIN 20 mcg (NDC 0024-5740-00). Maintenance Pack, NDC 0024-5747-02: Contains 2 prefilled burgundy pens for ADLYXIN 20 mcg (NDC 0024-5740-00). Prior to first use, ADLYXIN should be stored in a refrigerator, 36°F–46°F (2°C–8°C). Do not freeze. Keep the prefilled pen in the original package to protect it from light. After first use, store below 86°F (30°C). Replace the pen cap after each use to protect from light. Discard pen 14 days after first use. Inform patients that serious hypersensitivity reactions, including anaphylaxis, have been reported in clinical trials of ADLYXIN and during postmarketing use of GLP-1 receptor agonists. If symptoms of hypersensitivity reactions occur, inform patients that they must stop taking ADLYXIN and seek medical advice promptly [see Warnings and Precautions (5.1)]. Inform patients that persistent severe abdominal pain that may radiate to the back and which may or may not be accompanied by vomiting is the hallmark symptom of acute pancreatitis. Instruct patients to promptly discontinue ADLYXIN and contact their physician if persistent severe abdominal pain occurs [see Warnings and Precautions (5.2)]. Advise patients that they should never share ADLYXIN pen with another person, even if the needle is changed, because doing so carries a risk for transmission of blood-borne pathogens [see Warnings and Precautions (5.3)]. Inform patients that the risk of hypoglycemia increased when ADLYXIN is used in combination with a sulfonylurea or basal insulin [see Warnings and Precautions (5.4)]. Advise patients treated with ADLYXIN of the potential risk of dehydration due to gastrointestinal adverse reactions and take precautions to avoid fluid depletion. Inform patients of the potential risk for worsening renal function, which in some cases may require dialysis [see Warnings and Precautions (5.5)]. Advise patients to inform their physicians if they are pregnant or intend to become pregnant [see Use in Specific Populations (8.1)]. ADLYXIN can cause serious side effects including inflammation of the pancreas (pancreatitis), which may be severe and lead to death. These medical problems may make you more likely to get pancreatitis. Stop taking ADLYXIN and call your healthcare provider right away if you have pain in your stomach area (abdomen) that is severe, and will not go away. The pain may be felt going from your abdomen through to your back. The pain may happen with or without vomiting. These may be symptoms of pancreatitis. ADLYXIN is not a substitute for insulin and is not for use in people with type 1 diabetes or people with diabetic ketoacidosis. ADLYXIN has not been studied in people who have a stomach problem that causes slow emptying of the stomach (gastroparesis). ADLYXIN is not for people with slow emptying of the stomach. Who should not use ADLYXIN? are allergic to lixisenatide or any of the other ingredients in ADLYXIN. See the end of this Medication Guide for a complete list of ingredients in ADLYXIN. are pregnant or plan to become pregnant. It is not known if ADLYXIN will harm your unborn baby. Tell your healthcare provider if you are pregnant or plan to become pregnant while using ADLYXIN. are breastfeeding or plan to breastfeed. It is not known if ADLYXIN passes into your breast milk. Talk with your healthcare provider about the best way to feed your baby while you use ADLYXIN. antibiotics or the pain reliever acetaminophen. Take these medicines at least 1 hour before using ADLYXIN. If you must take these medicines, take them with a meal or a snack. You should not take these medicines at the same time that you take ADLYXIN. birth control pills that are taken by mouth (oral contraceptives). ADLYXIN may lower the amount of the medicine in your blood from your birth control pills and they may not work as well to prevent pregnancy. Take your birth control pill at least 1 hour before your injection of ADLYXIN or at least 11 hours after your ADLYXIN injection. Read the detailed Instructions for Use that comes with your ADLYXIN for instruction on using the ADLYXIN pen and injecting ADLYXIN. ADLYXIN comes as a disposable prefilled pen. Use ADLYXIN exactly as your healthcare provider tells you to. Do not change your dose unless your healthcare provider has told you to change your dose. Your healthcare provider should teach you how to inject ADLYXIN before you use it for the first time. If you have questions or do not understand the instructions, talk to your healthcare provider. Use ADLYXIN 1 time each day within 60 minutes (1 hour) before the first meal of the day and at the same time each day. If you miss a dose of ADLYXIN, take it within 1 hour before your next meal. Inject your dose of ADLYXIN under the skin (subcutaneously) of your abdomen, thigh or upper arm. Do not inject into a vein. See "What is the most important information I should know about ADLYXIN?" Severe allergic reactions. Severe allergic reactions can happen with ADLYXIN. Stop taking ADLYXIN and get medical help right away if you have any symptoms of a severe allergic reaction. See "Who should not use ADLYXIN?" These are not all the possible side effects of ADLYXIN. Call your doctor for medical advice about side effects. You may report side effects to FDA at 1-800-FDA-1088. How should I store ADLYXIN? Store your new, unused ADLYXIN pen in the refrigerator at 36°F to 46°F (2°C to 8°C). After activation, store your ADLYXIN pen at room temperature no higher than 86°F (30°C). Do not freeze ADLYXIN pens and do not use ADLYXIN if it has been frozen. Protect the pen from light. Replace the pen cap after each use to protect the container window from light. After activation, use the ADLYXIN pen for up to 14 days. Throw away the used ADLYXIN pen after 14 days, even if there is some medicine left in the pen. Do not use ADLYXIN past the expiration date printed on the label of the carton and pen. Do not store the ADLYXIN pen with the needle attached. If the needle is left on, this might lead to contamination and cause air bubbles which might affect your dose of medicine. See the Instructions for Use about the right way to throw away the ADLYXIN pen. Keep your ADLYXIN pen, pen needles, and all medicines out of the reach of children. General information about the safe and effective use of ADLYXIN. Medicines are sometimes prescribed for purposes other than those listed in a Medication Guide. Do not use ADLYXIN for a condition for which it was not prescribed. Do not give ADLYXIN to other people, even if they have the same symptoms that you have. It may harm them. You can ask your pharmacist or healthcare provider for information about ADLYXIN that is written for health professionals. What are the ingredients in ADLYXIN? Inactive ingredients: glycerol 85%, sodium acetate trihydrate, methionine, metacresol, hydrochloric acid, sodium hydroxide solution and water for injection. Manufactured by: sanofi-aventis U.S. LLC, Bridgewater, NJ 08807. A SANOFI COMPANY. For more information, go to www. ADLYXIN.com or call sanofi-aventis at 1-800-633-1610. Starter pack - Contains two pre-filled pens each with 14 doses. One 10 microgram (mcg) pen, each dose contains 10 micrograms in 0.2 ml. One 20 microgram (mcg) pen, each dose contains 20 micrograms in 0.2 ml. Read these instructions carefully before using your ADLYXIN pens. ADLYXIN comes as a pre-filled pen for injection. Inject 1 dose per day. There is no need to measure each dose. Talk with your healthcare provider about how to use the ADLYXIN pen and to inject correctly before using it. If you cannot follow all the instructions completely on your own, or are not able to handle the pen (for example, if you have vision problems), only use it if you have help. The ADLYXIN Starter pack includes two different colored pens that contain different strengths of ADLYXIN. Both pens are used in the same way. The green pen contains 14 pre-set doses; each dose contains 10 micrograms of ADLYXIN. The burgundy pen contains 14 pre-set doses; each dose contains 20 micrograms of ADLYXIN. You must start your treatment with the green 10 microgram ADLYXIN pen. You must first use all 14 doses from this pen. Then use the burgundy 20 microgram ADLYXIN pen. The plunger will advance along the dose scale after each injection. In the example above, the dose number shows there are 13 injections left in the ADLYXIN pen. Always check the label to make sure you have the correct ADLYXIN pen. Also check that it has not passed the expiration date printed on the ADLYXIN pen. Do not use ADLYXIN past the expiration date. Using the wrong medicine could be harmful to your health. 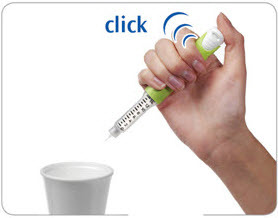 Inject ADLYXIN only by using this pen injector. Never use a syringe to withdraw ADLYXIN from the pen. Pen needles are not included with your pen. Always use a new needle for each injection to prevent contamination of ADLYXIN or possible needle blockage. Only use needles that have been approved for use with ADLYXIN. The ADLYXIN pen may be used with certain pen needles from Becton Dickinson, Ypsomed and Owen Mumford that are 8 mm long or shorter. Ask your healthcare provider which needle gauge and length is best for you. Do not reuse or share needles with another person. . Begin with the green 10 mcg ADLYXIN pen. Do not activate the burgundy 20 microgram ADLYXIN pen until you have finished the green pen. Before injecting the first dose of ADLYXIN you must activate the new pen. This is a one-time process called 'activation'. Steps 1 to 5 below show you how to do this. Activation is done to make sure that the pen is working correctly and that the dose for your first injection is correct. Do not repeat the activation process or you will not receive 14 doses from your ADLYXIN pen. The pictures below show how the activation window on the injection button of your pen changes after activation. The pen is not activated when the activation window is orange. The pen must be activated before injecting your first dose of ADLYXIN. The pen is activated and ready for injections when the activation window is white. Always use a new needle for activation. Remove the protective seal from the outer needle cap. Line up the needle with the pen. Push the outer needle cap containing the needle straight onto the pen, then screw the needle on until secure. Pull off (do not unscrew) the outer needle cap. Pull off the inner needle cap and throw it away. Keep the outer needle cap to remove the needle later. Take care not to injure yourself when the needle is exposed. The arrow will now be pointing towards the needle. Do not inject into the body. Point the needle into a container (like a paper cup or tissue). Firmly press the injection button all the way in to discard the liquid. You may feel or hear a "click". 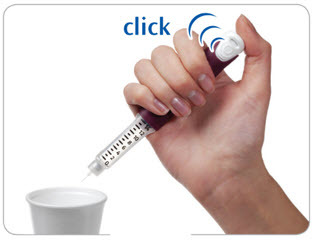 Keep the injection button pressed in and slowly count to 2, which is equal to 2 seconds. If no liquid comes out of your pen, see the Questions and Answers section at the end of this Instructions for Use. Check that the activation window is white. Step 5. The pen is now ready for use. Do not activate this pen again. For your first injection, go directly to Section 3 – Step 3. You do not need to replace the needle between activation and first injection if you inject yourself immediately after activation. Inject only 1 dose each day. Check to make sure the activation window is white before continuing in this section. Line up the needle with the pen. Put the outer needle cap containing the needle straight on the pen, then screw the needle on until secure. The arrow in the window will be pointing towards the injection button. 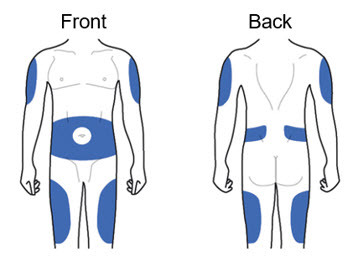 ADLYXIN must be injected under the skin and can be injected in any of the areas shown above in blue. These areas include the thigh, abdomen or upper arm. 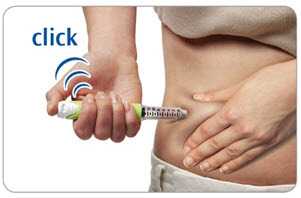 Ask your healthcare provider about how to inject correctly. Grasp a fold of skin and insert the needle (see the Injection sites section about where to inject). Press the injection button all the way in. You may feel or hear a "click". 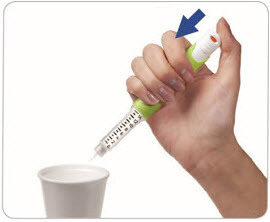 Keep the injection button pressed in, hold the pen in place and slowly count to 2, which is equal to 2 seconds, before you pull the needle out of the skin. If you do not hold the injection button in or remove the injector too early you may not get the full dose. Grip the widest part of the outer needle cap. Keep the needle straight and guide it into the outer needle cap. Grip and squeeze the widest part of the outer needle cap. Turn your pen several times with your other hand to remove the needle. Put the needle in a puncture resistant container (or as instructed by your healthcare provider). Step 7. Repeat all steps in Section 3 for each injection. Throw away a pen 14 days after activation, even if there is some medicine left. Once the green pen is discarded continue to Section 4 to begin using the burgundy pen. The green 10 mcg ADLYXIN pen is empty when the black plunger has reached '0' on the dose scale and the injection button cannot be pulled out fully. Once the green 10 mcg ADLYXIN pen is empty you must continue your treatment the next day using the burgundy 20 mcg ADLYXIN pen. This is used in exactly the same way. The burgundy 20 mcg ADLYXIN pen must also be activated before use. Follow all steps in Section 2. To inject a dose with the burgundy 20 mcg ADLYXIN pen, follow all steps in Section 3. Repeat Section 3 for your daily injections until your pen is empty. In the table write the date when you activated your pen and the date to throw it away 14 days later. Keep your ADLYXIN pens in a safe place out of the reach and sight of children. Protect your ADLYXIN pens from dust and dirt. Replace the pen cap after each use in order to protect the container window from light. Protect the ADLYXIN pen from light. Do not use ADLYXIN after the expiration date, which is stated on the label and on the carton. The expiration date refers to the last day of that month. Store your unused ADLYXIN pens in the refrigerator, 36°F to 46°F (2°C to 8°C). Allow your pen to warm at room temperature before using. Once activated, store your ADLYXIN pen at room temperature no higher than 86°F (30°C). Do not store your ADLYXIN pen with the needle attached. An attached needle might lead to contamination and may cause air bubbles which might affect your dose of medicine. Once your ADLYXIN pen is activated it can be used for up to 14 days. Discard a used ADLYXIN pen after 14 days. Do this even if there is some medicine left in the pen. Replace the pen cap before disposing of your ADLYXIN pen. Put the used ADLYXIN pen in an FDA-cleared sharps disposal container right away after use. Do not throw away (dispose of) the ADLYXIN pen in your household trash. Handle your ADLYXIN pen with care. You can clean the outside of your ADLYXIN pen by wiping it with a damp cloth. Do not soak, wash or put liquid on (lubricate) your ADLYXIN pen - this may damage it. If you think your ADLYXIN pen may be damaged, do not use it. Get a new one. Do not try to repair the pen. What do I do if I forget to activate the ADLYXIN Pen or inject myself before activation? 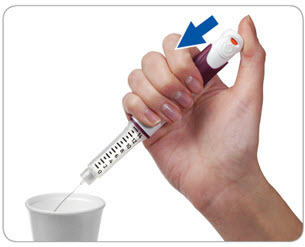 If you have injected yourself before activating the pen, do not correct this by giving yourself a second injection. Contact your healthcare provider for advice on checking your blood sugar. What do I do if there are air bubbles in the container? Small air bubbles in the container are normal and they will not harm you. Your dose will be correct and you can keep following the instructions. Contact your healthcare provider if you need help. What do I do if no liquid comes out during activation? The needle may be blocked or not properly attached. Remove the needle from the pen, attach a new one and repeat Steps 4 and 5 of Section 2 only. If still no liquid comes out, your ADLYXIN pen may be damaged. Do not use this ADLYXIN Starter pack. Contact your healthcare provider for help. What do I do if it is hard to press the injection button all the way in? The needle may be blocked or not properly attached. Pull the needle out of your skin and remove the needle from the pen. Attach a new needle and repeat Steps 5 and 6 of Section 3 only. If it is still hard to press in the injection button, your ADLYXIN pen may be damaged. Do not use this ADLYXIN starter pack. Contact your healthcare provider for help. If you have any questions about ADLYXIN or about diabetes, ask your healthcare provider or call sanofi-aventis U.S. LLC at 1-800-633-1610. One pre-filled pen contains 14 doses, each dose contains 20 micrograms (mcg) in 0.2 ml. 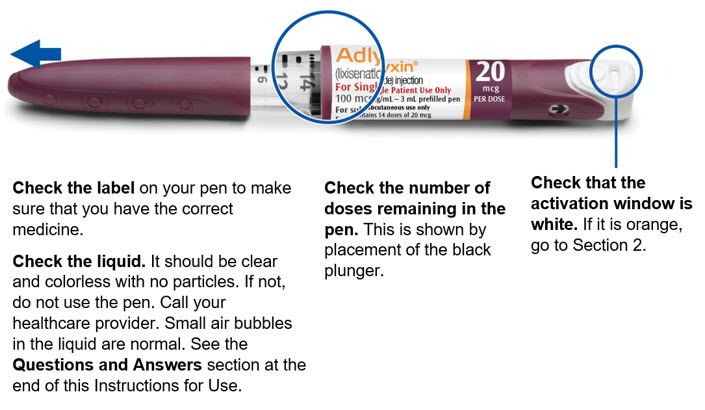 Read these instructions carefully before using your ADLYXIN pen. The plunger will move along the dose scale after each injection. In the example above the dose number shows there are 13 injections left in the ADLYXIN pen. Always check the label to ensure you have the correct ADLYXIN pen. Also, check that it has not passed the expiration date printed on the ADLYXIN pen. Do not use ADLYXIN past the expiration date. Using the wrong medicine could be harmful to your health. Always use a new needle for each injection. This helps prevent contamination of ADLYXIN or possible needle blockage. 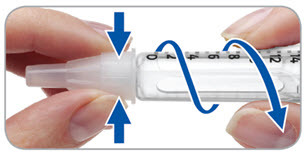 Activate the pen on the same day as your first injection with your new pen. Before injecting the first dose of ADLYXIN, you must activate the new pen. This is a one-time process called 'activation'. Steps 1 to 5 below show you how to do this. The pictures below show how the injection button of your pen changes after activation. Check that the activation window is now white. For your first injection, go directly to Section 3 - Step 3. Your dose has now been given. Pull the needle out of your skin. Step 7. Repeat all steps in Section 3 for your each injection. In the table, write the date when you activated your pen and the date to discard it 14 days later. Keep your ADLYXIN pen in a safe place out of the reach and sight of children. Protect your ADLYXIN pen from dust and dirt. Do not store your ADLYXIN pen with the needle attached. An attached needle might lead to contamination and may cause air bubble which might affect your dose of medicine. Put the used ADLYXIN pen in an FDA-cleared sharps disposal container right away after use. Do not throw away (dispose of) the ADLYXIN pen and loose needles in your household trash. Do not soak, wash or put liquid on (lubricate) your ADLYXIN pen. This may damage it. If you think your ADLYXIN pen may be damaged, do not use it. Do not try to repair the pen. The needle may be blocked or not properly attached. Remove the needle from the pen, attach a new needle and repeat Steps 4 and 5 of Section 2 only. If still no liquid comes out, your ADLYXIN pen may be damaged. Do not use this ADLYXIN pen. Contact your healthcare provider for help. The needle may be blocked or not properly attached. Pull the needle out of your skin and remove the needle from the pen. Attach a new needle and repeat Steps 5 and 6 of Section 3 only. If it is still hard to press in the injection button, your ADLYXIN pen may be damaged. Do not use this ADLYXIN pen. Contact your healthcare professional for help. Each prefilled pen will deliver 14 doses.